The Bankart lesion is an injury of the glenohumeral joint. This is a ball-and-socket joint binds the scapular and the humerus. Parts of the joint are the labrum, a fibrocartilaginous structure around the glenoid, the capsule and ligaments and supporting muscle tendons. In many cases of anterior dislocation patients have a Bankart lesion. A reverse Bankart lesion can occurs in case of a posterior dislocation. We can distinguish to types of Bankart lesions: a soft tissue Bankart lesion and a bony Bankart lesion. The image below shows a spin echo MR arthrographic image. It shows contrast medium interposition between the glenoid rim and the capsulolabral complex, which means that there is a Bankart lesion. If you want to be sure about the diagnosis you will do a MRI. It is the most common imaging tool used to diagnose labral lesions. Many patients who sustain a shoulder dislocation will sustain a Bankart lesion. Although Bankart lesions often occur in patients with shoulder dislocation, they are hard to detect in physical examination. A bony Bankart lesion can also be discovered by radiographs. Western Ontario Shoulder Instability Index (WOSI), which is a subjective quality of life measurement tool specific to shoulder instability. Walch-Duplay score, which is the gold standard score used in Europe. The European Society of Shoulder and Elbow Surgery recommended using the Walch-Duplay score which was inspired by the Rowe rating scale and takes into account both subjective and objective data (stability, pain, sport level recovery, mobility) to assess clinical outcome. The Walch-Duplay score is the most currently used score in Europe for the assessment of the patient undergoing shoulder stabilization surgery. However, it is not a self-administrated questionnaire. The Walch-Duplay score (0 to 100 points) and the WOSI (0 to 2100 points) were recorded at the last follow-up. The Walch-Duplay score is composed of four items: activity, stability, pain and mobility. According to the Walch-Duplay score, results were classified as excellent (91 and 100 points), good (76 and 90 points), fair (51–75 points) or poor (under 50). The correlation between the Walch-Duplay score and the WOSI is strong. The better the Walch-Duplay score is, the lower the WOSI is. The Instability Shoulder Index Score (ISIS) was developed to predict the success of arthroscopic Bankart repair. Scores range from 0 to 10, with higher scores predicting a higher risk of recurrence after stabilization. The Instability Shoulder Index Score (ISIS) to predict the success of isolated arthroscopic Bankart repairs for recurrent anterior shoulder instability. A 10-point score was created and applied retrospectively. A score above 6 was associated with a 70% risk of recurrence, and the authors proposed using supplemental surgical procedures (such as an open Latarjet) to address this high risk. ISIS has been used in several clinical studies. The studies have shown that you can use the ISIS for investigate several pathologies. Firstly, the examinator has to hold the arms in 90 degrees anteflexion. Then he has to a do passive endoration of the arm by use of his other arm. If the test is positive, it causes pain in the region of the deltoideus. During this manoeuvre the tuberculum majus drives under the coracoacromial ligament. This is the cause of the pain. When you have to examine a patient with an internal joint problem you can use a specific test: the internal rotation resistance strength test. The IRRST is a valid stability test, which differentiates an intra-articular pathology from an impingement syndrome. A study was carried out on 110 patients; the patients were split in 2 groups: people with internal impingement and people with outlet impingement. For this test was reported: a sensibility of 88% and a specificity of 96%. You have to stand behind the patient. His injured arm is in a position of 90° abduction and 80° of external rotation. (See picture). 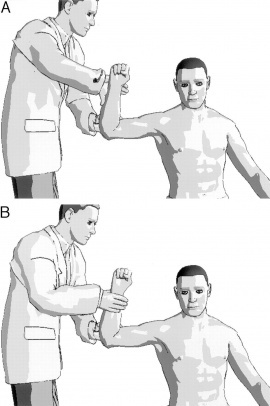 You have to ask the patient to resist maximally the first external rotation (A) and then the internal rotation (B). Here you are testing manually the isometric muscle for the external rotation and internal rotation. If the patient has a good strength in external rotation and a weakness while doing the internal rotation, than you can say that the IRRST is positive. A positive IRRST is based on the fact that at a fixed position of the arm, the medial rotators the caput humerus will do a translocation to the front against the frontal labrum. Arthroscopic repair contains: A suture anchor is placed medially to the fracture on the glenoid neck, and its sutures are passed around the bony fragment through the soft tissue including the inferior glenohumeral ligament complex. The sutures of this anchor are loaded in a second anchor that is placed on the glenoid face. This creates a nontilting 2-point fixation that compresses the fragment into its bed. By use of the standard technique, additional suture anchors are used superiorly and inferiorly to the bony Bankart piece to repair the labrum and shift the joint capsule. This way of surgery successful restores the shoulder stability with a high patient satisfaction. There are several options for interventions to the Bankart lesion. First of all we can make the difference between the operative and non-operative interventions. Besides these key factors physiotherapist should also keep in mind that every patient is different and that we should never forget to personalize a rehabilitation program. Focus of the rehabilitation program is on maximizing dynamic stability, scapula positioning, proprioception and improving neuromuscular control, as there are no specific exercises to improve the labrum quality. (Level of evidence 1A)(Level of evidence 2B) Usually the rehabilitation program is divided in 3 phases. The programs for non-operative treatment and postoperative rehabilitation are very similar. In the second phase a progressive passive motion is important, together with active-assisted range of motion exercises. (Level of evidence 1A)(Level of evidence 2B) Strengthening of rotator cuff muscles is initiated in balanced exercises. Examples of exercises are movements of the shoulder executed with elastic bands or dumbbells as dynamic open chain strengthening exercises. (Level of evidence 3A) Rehabilitation should include both closed and open chain exercises. An example of a closed kinetic chain exercise is quadruped position with scapula protraction, progressing to tripod position. A patient can continue to phase three when a normal passive range of motion is achieved. ↑ Widjaja A, Tran A, Bailey M, Proper S (2006). Correlation between Bankart and Hill-Sachs lesions in anterior shoulder dislocation. ANZ J Surg 76 (6): 436–8. ↑ Zaslav KR. Internal rotation resistance strength test: a new diagnostic test to differentiate intra-articular pathology from outlet (Neer) impingement syndrome in the schoulder. J. Shoulder Elbow Surg 2001 Jan-Feb;10(1):23-7.